No, wait. That's not right. "We're trying to stay under the radar," is what she said, which I interpreted to mean she was doing something new and different that they didn't want anyone knowing about. We were sitting in my office, in a comfortable SAYL desk chair almost exactly two months ago. Or at least, I was sitting in the chair, alone, reading an email from Champ. I was about to learn about the hottest new service around. A highly-anticipated, stealth mode start up that I knew everyone would be talking about, and using, six months from now. The only question I had was, what is it? I had been sent an email summons to preview the new thing from Caterina Fake, founder of Flickr and Hunch, and her team of incredibly talented developers, designers, and all around Web-based badasses (including Heather). I was to be under FrieNDA.2 This was new territory for me, and I think, for Fake. She is not exactly known for sharing details of as-yet-unannounced products. And of course, most people do not want to be my friend. And then the reveal: Knotes—sorry Pinwheel—would be like a Flickr for geotagged notes. A service that lets you collect and share notes based on locations. I love location-based services and apps, and have a long-running interest in them. And Pinwheel is, very much, something I've always wanted. A way to transmit and receive information about particular locations that isn't tied to one action—like a checkin, or a game. I've been using Pinwheel for two months, on my MacBook Air and iPhone. It's good, and I look forward to it getting better. It's a beta, incomplete and with bugs, but it feels solid and full of promise. The notes are like little messages in bottles, carrying both current events and nostalgic messages out of the past. They give me insight into my friends' lives—their joys, their pains, their passions—and into those of strangers too. It's made me more aware of the world I live in, and given me the chance to share my world with my friends. It's probably the best new thing I've used right out of the gate since I logged onto Instagram for the first time a little more than a year ago. I love it, straight up. Pinwheel lets anyone leave a note tagged to a particular location. You can leave both text and images. You can tag notes so they are searchable. You can leave notes privately, or publicly. People can leave notes for you to find. Because you can enter location data on where you live and work into Pinwheel, without revealing it publicly, others can leave notes for you at your home or your office, without actually knowing where either of those are. You can follow other people, to see the notes they leave. Businesses can leave location-based advertisements. These are called "sponsored notes." Fake has lots of notes. Most are articulate, precise, and rehearsed. Yet others are casual and spur of the moment. I find myself using it in the same way. I've written long travelogues about my time in Kuwait, and short inspired blasts about New Year's Day. I leave a lot of private notes, and I like that. But the best part is reading other people's notes. There are at least three ways to wade in: by location, by friends, and by tags. And in the past few months, I've done all of those. Location is serendipitous. I have a shortcut to the site on my phone's home screen—it works well as a mobile web app—and I pop it open in new locations, and bump into all kinds of new ideas that often feel like secrets. These stories have always been here, I just didn't know about them before. Sometimes people leave news-as-notes. The backstory of a house fire, which I can read while looking at the newly-charred structure in my neighborhood. Sometimes these are tips. ("The best hidden beach on Highway One.") And often, they are deeply personal. When I look at the notes left by my friends, I get to see the people I know talk about the places they inhabit. It lends itself to storytelling, confession and advice. Births. Deaths. Dates. Triumphs and disasters. Tags offer another avenue of exploration. Search for the food tag and drill down by location to see what's around. Or if I want to discover a new vacation spot, I can check out the beach tag. But mostly, this is a service very much in development. The private beta just launched yesterday, and even that slow roll out has greatly expanded the user base. People are going to use Pinwheel for all kinds of unexpected things, in all kinds of unexpected ways. They will pop open their laptops and phones and see what's around them, or better yet, describe it. They will use it to tell stories and play games and reveal themselves to the world, and use it to learn about the world themselves. It is as wonderful in an old haunt as it is in somewhere utterly unfamiliar. Because even those places we know best, we often know nothing about. In terms of approaching how to use location as a tool, and a toy, and a treasure chest, Pinwheel is, I say, exactly right. And as it grows and grows, it's just going to get better and better. It will be useful, and fun. 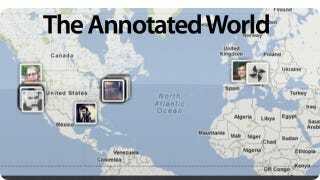 It will be the entire world—all of it—annotated. Would you like to join Pinwheel? I have one invitation left. Whoever leaves my favorite note in the comments below, linked to map data, gets it. This is pretty open-ended, so as long as you don't violate our comment policy, go nuts. 2. An N.D.A., or non-disclosure agreement, being the more or less standard contract one is often asked to sign before previewing a new product. The FrieNDA? It's just a more informal arrangement. It was basically a way of saying, "please be cool and don't blow this." 3. Before launching in private beta yesterday, the alpha of the product was called Knotes.